At last, a business financing company which allows you to obtain quick access to business capital. Ask us about our business line of credit program. Nuestro equipo a ayudado a miles de empresas latinas como la suya, obtener financiamiento. First, fill out a 1-page simple application online or on your smart phone. In addition, there’s no fee or obligation to obtain funding. To finalize, all we need is the last 4 months of bank statements. Afterwards, we’ll review your business profile. The best part of it all, is that you will receive numerous business financing options to choose from. One of our specialists will help you choose the best choice. Above all, this can take 30 minutes to 48 hours. At this point, you select the option. You can execute your loan agreement online. Shortly, you will receive the funds in your business bank account. Unquestionably, Lendinero makes business financing simple. For a quick response tell us a little about your business, by filling out the form. One of our funding advisors will help you obtain the best possible financing offers for your business to run as smooth as it can. At last, you can enjoy a true business line of credit without the banking hassles. Draw funds with a click of a button. To sum up, only pay for what you use. Get up to $150,000 fast. Now you can enjoy a fixed weekly payment on your term loan. Equally important, you can choose repayment terms ranging from 4 months to 18 months. Without delays, a bridge loan is a short-term business loan while your business secures long-term financing. Now, you don’t have to wait for the cash you need. Sooner or later, you will need quick financing. Inquire Today!! Finally, owning real estate increases business valuations. Today, you can refinance or purchase your property with our business financing services. Above all, we will guide you by the hand. personalized service you won’t find at any other lender. 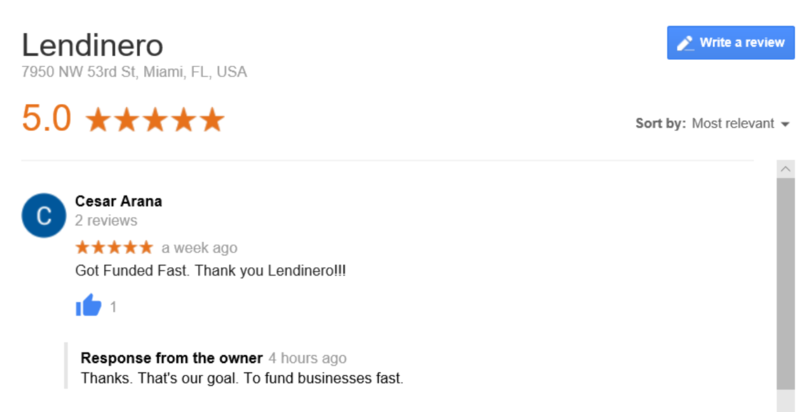 Most compelling evidence is what other people say about Lendinero. Most important, is to read our reference letters from government agencies, partners, clients and press. Moreover, Lendinero has been featured in major magazines. Certainly, you need a business financing company that can deliver fast solutions. In a word, you have come to the right place. Obtain tips on how to improve and grow your business. We grew earnings in excess of 400% during the last four years. Now, we share with you business advice that we utilized to help us grow. In other words, you can use this advice for FREE. 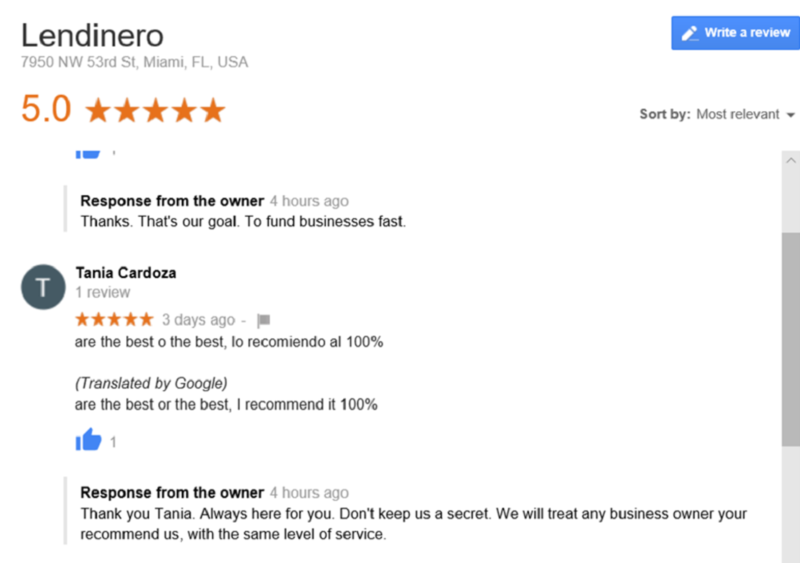 Lendinero receives 5 Star Reviews on Google, Facebook, Angel List, Yelp, Trust Pilot and Other Portals. Very satisfied with the business funding services provided by Lendinero. Obtaining a business line of credit with a bank is challenging. Lendinero made the process simple. In the beginning, I was skeptical. I had never obtained a loan online. I applied for a business line of credit with Lendinero and 4 days later I was approved. I don’t think banks can do this. I was very impressed and recommend Lendinero. Major publications have written about Lendinero. Gaining your trust is one of the highest priorities at our company.